One Step Away's new full-length studio album "For the Broken" is catching national attention, now playing on over one hundred radio stations across the United States. One Step Away puts a new twist on Pop|Rock. Blending high energy performances with the vocal talents comparable to the best of American Idol, One Step Away appeal is far-reaching. 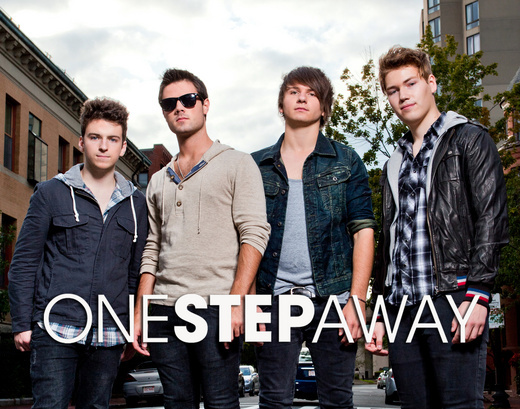 One Step Away made their national TV debut on the MDA Telethon as winners of the 2011 Clear Channel and iHeartRadio Get Discovered! Contest. One Step Away band members are also consummate song-writers. Their recently released eleven song album, "For the Broken", is jam-packed with heart-touching originals. For the Broken has garnered them escalated national attention and awards, including a coveted spot in Alternative Press as an Unsigned Band of the Month, an Independent Music Award nomination in Pop|Rock and dozens of Featured Artist Spotlights, all categorizing One Step Away as the next major “Break Out Artist”. One Step Away has appeared on hundreds of national and local TV and radio stations across the country including: ABC, CBS, NBC, FOX, CWN, MNT, IND, TELEMUNDO, WCRB,WBZ, WCTX, WNAC, WSBK, WPXT, WXKS KISS 108, WWLP, WBRU, WZLX,WPXC,WMLN, WSNC, WCAP. One Step Away has performed with big name artists on stages across the country like Universal Studios Hollywood, Fox Theater, MGM Grand and more including: Hot Chelle Rae, Carly Rae Jepsen, Enrique Igesias, The Wanted, Gym Class Heroes, Andy Grammer, Outasight, Dev, Neon Hitch, Adam Lambert, Flo Rida, Karmin, Jojo, Sammy Adams, Drake Bell, Nate and Alec Wolf (Naked Brothers band), Jordin Sparks, Il Volo, Jon Secada, Rich Sambora, Greyson Chance, A Rocket to the Moon, Cute is What We Aim For, Early Morning Blues (with Brian Johnson formerly of Boys Like Girls) and Darius Rucker.